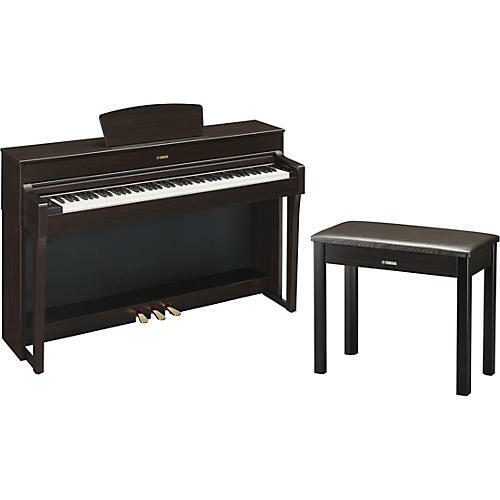 The YDP-184 is Yamaha's most advanced Arius digital piano. From the cabinet to the sounds to the features to the keys, the entire instrument has been examined and redesigned to ensure it carries Yamaha's best technology and craftsmanship. The YDP-184's re-designed interface lets you browse 24 instrument Voices with ease, taking care to include a shortcut to the world-class CFX concert grand piano. Whatever instrument or song file you are in, one touch gets you to the YDP-184's main attractions, its breathtaking piano sound. New to the Arius series, the YDP-184 features Yamaha's stereophonic optimizer, which creates a realistic sense of spaciousness when listening via headphones. Research indicates that a significant percentage of peoples' time spent at their digital home piano is spent under headphones, so Yamaha developed a better processor for headphone signals from the piano. You can enjoy the realism of Virtual Resonance Modeling (VRM), and high-quality digital effects through the on-board stereo speaker system. Play along with built-in rhythm patterns and record your performances using the built-in MIDI recorder. And with over a century of acoustic piano manufacturing heritage, it only makes sense that the best digital piano action can be found on a Yamaha.